The summer after I graduated from college, I stopped counting the number of weddings I attend in a year. It’s too big a number. And it pains me to think of the money I’ve spent on cookie sheets and spatulas and bathroom trashcans. The number of weddings that I’ve been an attendant for is much smaller, as it well should be as I think being in a wedding demands a certain kind of intimacy in friendship, and it’s even more painful to think of the money I’ve spent on manicures, hair-dos, and dresses I’ll never wear again. As I now sit firmly in my late-20s, this is my confession: I’m tired of going to weddings. As I write this, I’m aware that it sounds like the sour lament of a girl who’s pushing 30 and is still single. It’s not, I promise. It’s true that I would like to be married one day and I’d prefer that day come sooner rather than later, but my every thought is not focused on my relationship status. I’m single, but my life is full – of activity and of love. I’m single, but I’m not alone. I’ve come to rest in this on the inevitable days when the sting of the loneliness of singleness is most intense. But, while I’m content in my singleness, as I hope to one day be content in a marriage, I have to confess something else: I’m tired of going to weddings, and it’s because I’m single. A wedding is the least safe place to be single, if you ask me. It seems like when the ceremony’s over and the chicken has been served and the champagne is readily available, that everyone and their cousin – and I mean that literally – feels like they have permission to ask the question that every single person hates to hear: “When’s it going to be your turn?” And then they feel like they have permission to comment on what I should be doing to meet someone. Let me stop for minute and make a request. If you are one of those people who asks that question at a wedding, please for the love of all that is holy, stop doing it. I think I can safely speak for all single people everywhere when I say that if we’ve met someone and we want to talk about it, we will. Otherwise, ask us about our jobs or our pets or the Indians. Leave it to us to make the call on dialoguing about the most intimate details of the most important relationship we might ever form. 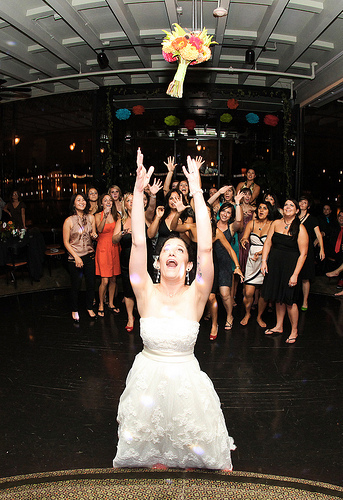 Oh, and don’t even get me started on the bouquet toss, because there’s nothing safe about that. Where did we get the idea that it’s okay to pelt our single girlfriends with a bunch of flowers? As if we didn’t feel badly enough, please – throw something at us. In fact, launch it at us with gun-fire force and then encourage us to throw ‘bows to limp away holding the “prize,” which is your used and now broken clump of flowers that you spent too much money on and that will be brown in a week’s time. Awesome. You’d never guess so thus far but, the thing is that I actually really love weddings because I actually really believe in marriage. I believe in the partnership that is created when people say, “I do.” I believe in the covenant that exists when people vow to be faithful and commit to loving each other, and I believe that marriage does give us a really cool image of Christ’s love for the Church. I have loved every penny I’ve spent and every moment of every wedding I’ve been a bridesmaid in because I believe these things. Because I believe these things, I don’t really want to be tired of going to weddings. What I really want is to go to weddings, as a single person, and be hopeful – hopeful that marriage works, hopeful that not everyone who marries crumbles to divorce, and hopeful that one day it might just happen for me too. I want to be at a wedding and celebrate with all the people gathered in the church and at the reception in the simplicity of loving the same two people, who are doing something important and awesome in joining their lives together. I want to drink champagne because I’m toasting their life together. I want to go to weddings knowing that they’re pictures of good in the face of bad, glimpses of restoration for broken people, a little light in an often dark world. I don’t want to be tired of going to weddings, but I am. So, my question is, how do I keep from being exhausted? *Note: Other 20-somethings are confessing things over at Ally Spotts‘ blog. Check it out here. A favorite author of mine, Rachel Held Evans, allowed me to guest post on her blog today. I love being able to share my story and experience of being single in the Church and the honor that I think being bridesmaid is, so make sure you check it out here. You can also find RHE’s blog linked on my page, so make sure you also check out what she’s writing. You won’t be sorry.